Just like in relationships, communication between sellers and buyers are key. This is especially when shopping online because as the buyer, we may not be familiar with a product or item, or we might want to know more about it before committing our money. Or we might want to be assured that you are a legitimate business we can trust. When a company or person sells online, I’d expect a certain level of technological savviness and a reasonable turnaround time for answering email enquiries. You’re a company and you’re a business – you’re supposed to be efficient. 48 hours is the maximum time I allow personally, unless I’m informed otherwise by the sellers that they are away. I also factor in time difference and weekends. When I was a seller on ebay, I replied to emails within 24 hours – I offered what I expected to receive. Happily, I did usually receive what I expected, even on etsy where many sellers aren’t full timers. However, when I don’t receive a response to my email enquiries after a week, I get upset. 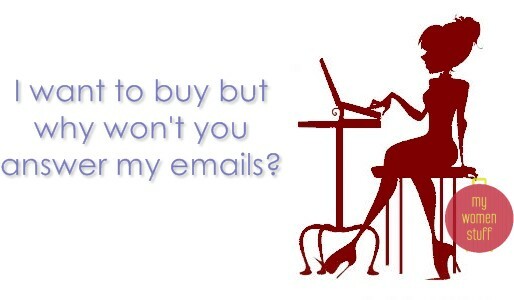 Its not that I don’t want to buy from you – I would if you’d just answer my damned email! This happened to me just recently by the way, so I speak from experience. I noticed that Company A was selling similar products as Company B but at reasonably lower prices. The first 3 emails to Company A were promptly answered. The subsequent ones and the ones sent most recently were not answered at all till today. I then wrote to Company B and every single email was replied to within 24 hours max. Actually, it was replied to within an hour! Bearing in mind there is a time difference as both companies were in the UK, this was impressive. Needless to say, Company A lost a potentially rather large sale and Company B gained it, even despite the price difference, because I’d rather pay for something I want from a company that actually communicates with me, rather than throwing money at a company that doesn’t – what if I don’t receive my products or get something damaged? I’d never be able to get hold of them! So, note to online sellers and companies looking to sell online : If you want to inspire confidence, good communication is key whether pre or post-sale. I’d love to hear your thoughts on this, and whether you’ve had a bad or similar experience lately. If you are an online seller, is prompt communication with your potential buyers something you place importance on? Note: I refer here to proper companies that choose to sell their products online, not the blogshops that are sprouting like mushrooms after the rain. I realize that many of those who run the latter are not doing it full time and I’ve never bought anything from a blogshop so I am no judge of their service or reliability. My most recent purchase on ebay is in dispute. I activated buyer protection from paypal as the seller tried to cheat me saying that my purchase was sent via registered post. But I checked with the post office, the item was sent to a different address. My purchase came finally, via non registered post. However, when I open it up, I realised that its a fake. I think this would be the same even for blogshops. Even if the sellers aren’t full time sellers, but it’s still their shop and their responsibility. Your experience was from an actual retailer? That’s unbelievable. I have only experienced that with blogshops and it really does turn one off from doing business with them. I’d rather go with a seller that communicates well as well. i do shop online few times but only the one featured in ur blog ie strawberrynet,tiny tapir,lovng mineral..been following ur blog more than a year now and i do spent lots of RM for make up and skincare since then (no thanks to you, hehe!!) ..but i like reading ur blog compare to others and i do noticed a lot of other people also do since many comments were written every day. So far I’ve been lucky… all my online purchases, whether established cos or blogshops (even through Lowyat.net) have been okay. *touch wood* But I do agree with you that there should be a 24 hour turnaround time in responses (I give a little bit more leeway for blogshops since they are not doing it full-time). This online shopping website I went to was not a blog site and it sells pre-order and ‘authentic’ clothing (was claimed by the seller on her web page) which was cheaper compared to other sites (if it’s really authentic). The site also have many ‘good’ reviews posted on its page from its customers. I placed an order and make payment on 31/3/2010 and the scheduled date of my items arrival was supposed to be on 19/4/2010 (posted on the page by seller). On the 17/4/2010 I received an email from the seller that informed me the date of my item arrival was changed to 30/4/2010. I sent an email to asked the reason of the delayed but received no reply from her. After that I sent a few more emails and waited for 4 days. The last email I sent I stated that I will make a police report if she was not going to reply me only she replied my email and the reason of the delayed she gave me was due to cargo ship delay at the custom. I was already feeling very worried and insecure by then, but I had no choice other than patiently waited for 30/4/2010 to arrived. To my horror, on 29/4/2010 the seller sent me an email to informed me that my parcel arrival have to be delayed again!!! The reason given was the same – problem at the custom!!! This time she didn’t promised me the date of arrival anymore and I was so worried that I might get cheated by her as I spent quite a lot ordering from her. I kept pressing her with emails everyday to inquire about the status of my parcel. Finally on 5/6/2010, I received an email from her to informed me that my parcel will arrived at my house in 2 days. FINALLY, I did received my parcel but my nightmare never ended till there. Out of the 3 items I’ve ordered, 1 of the item was wrongly sent to me!!! It was not the 1 I’ve ordered!!! Not to mentioned that all the items was in low quality and without its brand tags!! I complained to her on an email with pictures of the wrong dress she sent me. I’ve even requested for a refund but this time the seller informed me that she was being cheated by her supplier and was broke!!! can you imagine this??!! I do hope I can post the name of the seller on this site so that other people will not become a victim like me. Anyway, I just want to warn everyone that whatever was being posted on the site or promised by the seller (authentic clothing, good customers reviews, scheduled date of parcel arrival, etc..) was possibly fake!! BEWARE!! I’ve been shopping online for the past ten years, and thank God, I’ve only had problems once, and it was on eBay. I bought a Lancome product but it never arrived. Countless emails sent, none replied. When I checked the seller, he/she disappeared. Deleted the account. It was too late for me to even put negative feedback. I thought the same problem arose when I bought a Sass & Bide jacket on eBay as well. Thank goodness it was only sitting in the post office, and that they’ve forgotten to leave me the parcel-pickup card. Other than eBay (and I guess, blogshops too, but I’ve never bought anything from the latter so I can’t judge), I expect good service from proper online stores. Excellent service, even. Bad communication will definitely send me away. And with my big mouth, other potential customers too. Yes, totally agreed that the best way to get a sale is the communication between merchant and customers. If we cannot contact the seller at all, what can we aspect the money we bank in to their account or paypal to their account can get our product after payment??? I found more secure and reliable to purchase items from those big online companies , their services are some how much more better than those blogshops and most ebay sellers.